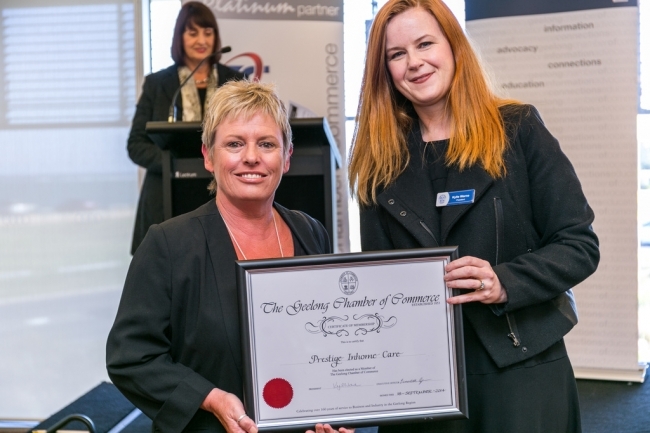 Prestige is excited to announce that is has been inducted into the Geelong Chamber of Commerce. The induction took place on Thursday 16/1014 at the After 5 function at Wyndam Resort Torquay. The Chamber of Commerce is one of Australia’s leading regional business bodies – boasting more than 790 members and with a rich, long and successful history of advocating on behalf of Geelong business. It is unashamedly ‘pro business’ with the interests of Geelong businesses the driving force behind our efforts to ensure a healthy economy for industries and businesses – big and small – operating in the Geelong region. It’s role is also to support, educate and facilitate a healthy, vibrant business community. Our networking events are the largest in the region and designed to encourage business professionals to interact with each other and expand their business contacts. The Chamber also offers a diverse range of services that are designed specifically to facilitate the growth of businesses in the region. The Chamber also has the important role of being the ‘go to’ place for information that allows business to enhance its skill base, explore new directions and grow its market share – whatever the industry. It also provides an abundance of networking of opportunities, allowing businesses to: connect and form strategic business-to-business affiliations; gain access to areas of government; and, promote themselves within the region.